In our 2008 report, we zeroed in on the influence of excise tax increases at the county level, using a proprietary dataset of cigarette sales obtained by a large Midwestern wholesaler. This micro-level data and our analysis served as a robustness check on both the theoretical underpinnings of our larger, state-level statistical model. 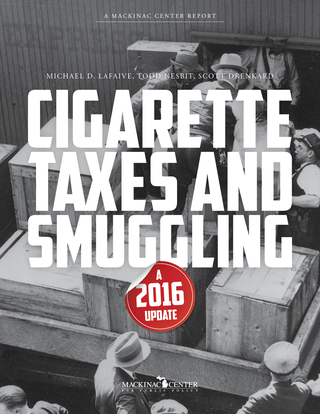 This county-level analysis also helped us shed light on the nature of casual smuggling — low-level tax avoidance through the cross-border purchasing and transporting of cigarettes for personal consumption from a lower taxed state or other taxing jurisdiction. The wholesaler data ran from January 2006 through September 2008, during which time two of Michigan’s neighboring states — Indiana and Wisconsin — raised their cigarette excise taxes. This allowed us to peer into the purchasing decisions of Michigan retailers in counties bordering those states. Indiana raises its excise tax 79 percent, from 55.5 cents per pack to 99.5 cents in July 2007. In January 2008 Wisconsin’s excise tax climbed by 130 percent, from 77 cents per pack to $1.77. Economic theory suggests that smokers in Michigan would buy more cigarettes from in-state retailers when excise taxes on cigarettes are raised by legislators in neighboring states. The reason for this is that the relative benefit of crossing into nearby states to buy cigarettes declines as the tax-induced price of cigarettes in those states rises. This makes shopping closer to home a more cost-effective alternative. The data bore out the theory. Sales of cigarettes from the large wholesaler to Michigan retailers in counties bordering Indiana in the three months leading up to the Hoosier excise tax hike taking effect leapt by 58 percent. Retailers were clearly stocking up for what they predicted would be an increase in sales on their side of the Michigan-Indiana border. The higher sales were generally maintained after the hike took effect too, running 53 percent higher than they had before the adoption of a cigarette excise tax increase in Indiana. The sales response to excise tax hikes was smaller in Michigan counties bordering Wisconsin. Sales to Michigan retailers only increased by 8 percent. We speculate that this was partly a function of the relatively smaller populations in Michigan-Wisconsin border counties — they are all in the western part of Michigan’s sparsely populated Upper Peninsula.